This week’s seed is in celebration of the release of the Rocket Rangers expansion for the Ubiquity Roleplaying System. 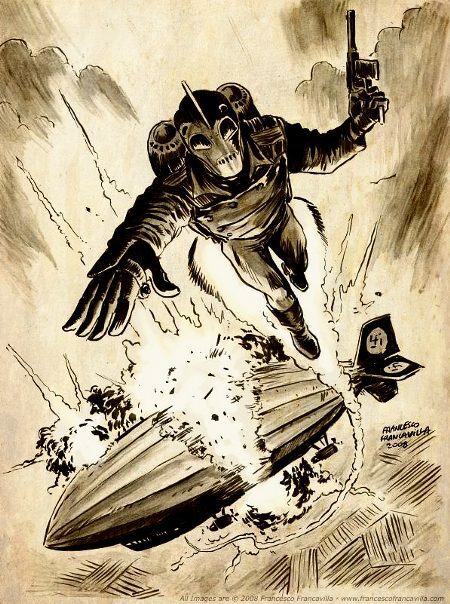 There is something really magical and compelling about the Rocketeer, and this release really helps GMs bring this sort of high-flying, rocket-propelled action into focus. The squad is called to jet into position on a rocky, volcanic island, which has recently risen in a fiery tantrum from the depths of the Mediterranean, and is suspected of being turned into a Nazi submarine base. The characters will be dispatched to stop the enemy before he can dig in and get started. While investigating and dealing with Nazi patrols, the squad must split into smaller groups to get things done and clear the rock of its vile threat. This is easy if your group have made members of the Rocket Corps, and still not much of a problem if they are instead some sort of rocket-enabled troop of do-gooders. If they are a bunch of adventurers with Rocket Packs… your mileage may vary. Arriving at and exploring the island will be standard fare for a regular squad, and it should set the stage for the heroics to come. Cliffs, steam vents, the hint of brimstone from lava stirring in the still stirring heart of the island, and the strange sense that someone, or something is watching them, should all be second nature to tough corpsmen like the Rocket Rangers. The characters are sent in as an advance squad to try to prevent the Nazis from gaining a foothold on this new island, but some have heard rumours that the enemy has some sort of new weapon which can deform the crust of the Earth itself! Is this just the first sign of that weapon at work? The clock is ticking as Allied and Axis surface vessels race to converge on the area, but may already be too late. The Bayern class dreadnought Saschen, thought to have been scrapped before launch, is anchored offshore, serving as the operation’s temporary HQ with 2 Destroyers. The Nazis have found an artifact in one of their occult expeditions abroad which they have mounted aboard the Saschen and harnessed for nefarious purposes. Their test of the artifact resulted in the birth of this new volcano and fostered a belief that the volcano is actually a portal of sorts to a pocket of fabulous wealth and power below the surface. The men in charge of the artifact itself have gone completely mad, but unfortunately are still maniacally lucid and have begun planning the conquest of the world, which in terms of preparing this island as a stronghold, coincidentally coincides with the wishes of their former overlords – the Wermacht. What does the Squad do first? For a resourceful fellow like you, with your talent for defining equipment in RPG terms, I am not certain it will be a worthy purchase – particularly if you already own the Savage Worlds version. The text contains Adventure Seeds for military and non-military approaches, expanded and very detailed rules for Rocket Packs and their fortes and foibles, villains, and a thorough look at the Rocket Ranger Corps. Throughout, it is written from the point of view that players will be soldiers in that Corps. The text contains some differences to the original for Savage Worlds, but is otherwise focused on being a conversion. Addenda: I think it makes a great handout to prep players for the Rocket Corps, and the threats they face. The tone, and content put a person somewhat in mind of those training films from the 40’s. Nice. May be getting back to the HEX stuff in China soon.